Ferry to Rosslare Ireland Invasion! The Welsh town of Fishguard can be found in Pembrokeshire. It’s Welsh name Abergwaun, means ’Mouth of the River Gwaun’, which explains where it can be located on the map of Wales. The town is small with a population of about 5300 people and is basically divided into two parts, the main town of Fishguard and Lower Fishguard. Lower Fishguard is referred to locally as ‘Lower Town’ and essentially represents the location of the original hamlet that grew into the Fishguard we know today. Within the newer, main part of the town can be found the high street shops, the parish church and most of the recent residential developments. Connecting the two parts of the town is a steep and winding hill that is well worth experiencing! 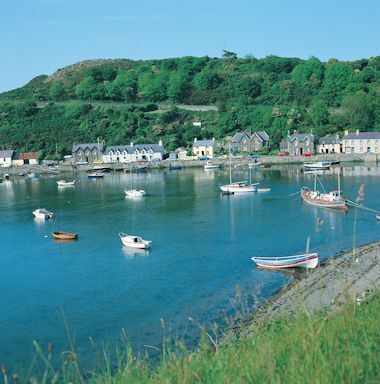 The two parts of Fishguard form a typical fishing village with a short tidal quay and is well worth a visit. 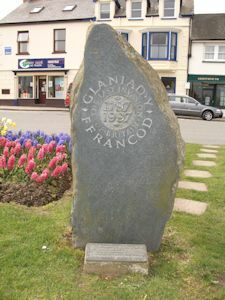 The area around Fishguard held the historic Welsh name of Cemais was formed part of the province of Dyfed, which was formally know as Deheubarth. This area of Wales experienced numerous raids Viking raids during the latter part of the 10th Century that resulted in Norse trading posts and settlements developing across the area. Indeed, the name Fishguard means fiskigarðr or "fish catching enclosure" in old Norse language thus suggesting it was a trading post at some point, though no evidence is available to support this claim. In its early days the town was defended by stout walls with the remains of a Norman Motte visible at the south end of the high street that follows the same path as it did in Norman times. In 1603 there is some evidence that the town formed part of a marcher borough. Lower Fishguard developed during the 18th Century to become a herring fisher and port from which trading took place with ports such as Bristol, Liverpool and Ireland. Records indicate that in the late 18th century it had 50 coasting vessels, some of which exported salt herring and oats. A key date in the history of Fishguard is 1779, when a French force invaded the town. This invasion is officially the last time Britain was actually invaded by the foreign force when 1400 French soldiers landed near the town. The Black Prince, who bombarded the town because a payment of £1,000 was not paid, was implicit in the 1779 invasion, though two days later the entire invasion force surrendered!. In 1781, Fishguard Fort was completed which overlooked Lower Fishguard. The latter half of the 19th century saw the importance of the port decline.